Pet Rest Gardens, established in 1976 is a quiet well maintained Pet Cemetery and Crematory located in Flushing, Michigan. We are a full service aftercare provider serving pet owners and veterinarians throughout mid-Michigan. 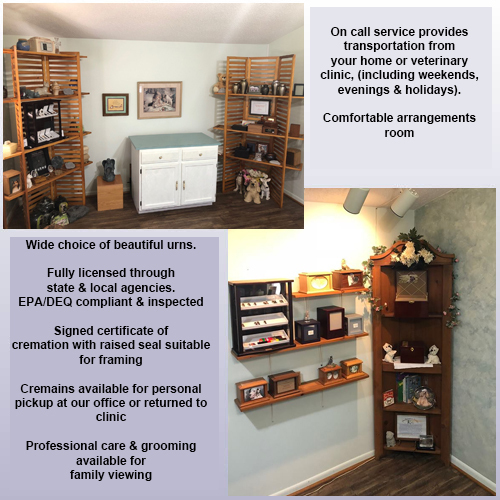 Every life is worth remembering and Pet Rest Gardens provides many options to assist you in arranging services for and memorializing your four legged family member. For many of us, memorializing our pet is part of the Grieving Process. It is the means we choose to safeguard the memory of our loved pets. Cremations or Burials are only the beginning of this final farewell. Remembrance may be as individual and unique as the pets themselves. Only you and your family knows what feels right. You owe it to him to worthy of such devotion. To guide and advice you with important decisions with respect and compassion during a difficult and emotional time. Pet Rest Gardens’ high moral and ethical standards will never be compromised. You can always expect honest and integrity when using our services. Who would use a pet cemetery or have their pet cremated? Download the Pet Rest Gardens Brochure.